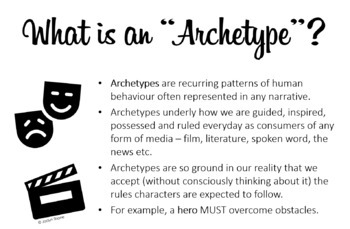 What is an "archetype" and how can your class benefit from an archetype analysis when studying the Hero's Journey (or Monomyth)? Introduce students to the following primary and secondary archetypes most commonly present in narratives: heroes, mentors, threshold guardians, tricksters, shadows, heralds, shapeshifters and allies. Teacher notes, student presentation with fun quiz and archetype note-taking pages that could be used for ANY novel or film analyzed in class! 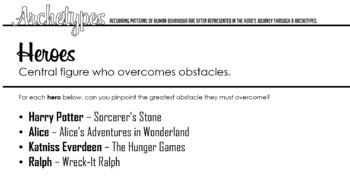 10-slide presentation outlining the common archetypes in the Monomyth narrative, with fun critical-thinking prompts for each archetype, "for each trickster below, can you determine how they trick the hero or cause mischief?" followed by trickster archetype examples such as Cheshire Cat, Loki, Gollum and Dobby. Lined and unlined versions of the worksheet/graphic organizer for easy differentiation, giving students the choice to note-take, write sentences/paragraphs or doodle and draw ideas! 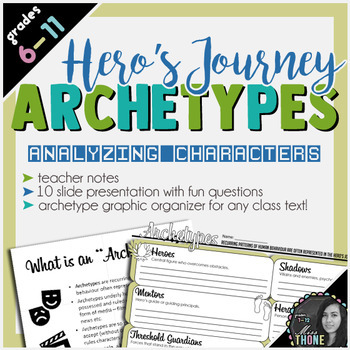 This collection of archetype resources can be used alongside my Hero's Journey Presentation for fuller student comprehension of the class text. 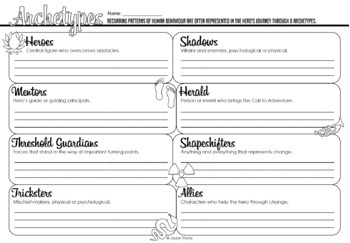 Students could note-take from the archetypes presentation into the graphic organizer or, alternatively, once students have been taught the archetypes present in the hero's journey, they can analyse the class text to find examples of each archetype in pairs, groups or independently. Love this product? Think a colleague would too? How about purchasing an additional license? Additional licenses for all of my products are discounted! Did you know that you gain TPT credits, simply by rating the products you buy? Please go to your My Purchases page. Beside each purchase you'll see a Provide Feedback button. I value your feedback greatly as it helps me determine how I can tweak or touch up a product. Please don't hesitate to ask questions by visiting my Q&A tab. Lastly, to receive notifications of new products and upcoming sales, look for the green star near the top of any page within my store and click it to become a Follower.